Getting dressed this morning in my "cute" patriotic jean jacket - home alone - my thoughts were racing. Our Flag represents freedom. The Red, White, and Blue. Many over the years have fought for that freedom. Many have given their lives. Today, my son is not here worshipping with us for that very reason. 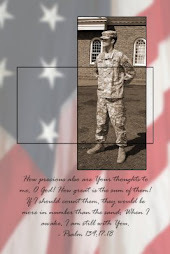 He is serving our country. He is preparing to go to war. He is one of the ones presently defending this freedom that I am talking about. So, today, I get dressed, get in my car and go to worship. No fear - No threats - No worry - free. I hang a flag from my porch (now with at yellow ribbon at the base) and Thank the Lord for what it represents. I often sing "that is my flag, that is Old Glory, long may She wave!"